This small feed pellets making line is specially designed for homemade pellet mill plans about manufacturing forage pellets for fish, sheep, cattle, rabbit, horse, chicken, duck, goose, pig and other livestock, etc. The diameter of feed pellets made by the feed pelletizer in this small feed pellet production line ranges from 2mm to 8mm. 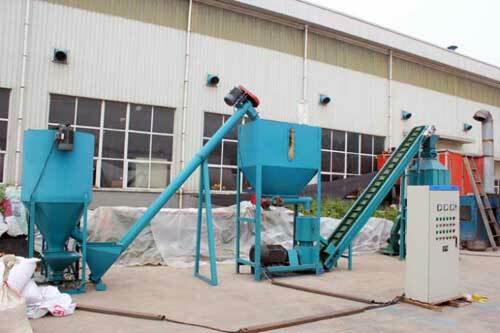 The forage pellets output capacity of the feed pellet mill machine is from 600kg to 1000kg per hour. This small assembled feed pellets line contains all the necessary machinery you need in manufacturing forage pellets and combines all the production process from grinding, mixing, pelletizing raw material and conveying and cooling the final pellets. All machinery contained in the whole process of manufacturing feed pellets. Easy installation and operation: This assembled small feed pellets production line only takes you a few minutes to assemble and install all the parts. You do not need technician or any qualified person for doing this. You, can make this! The operation is just as easy as the installation.